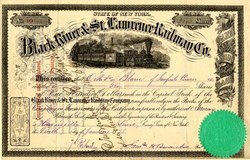 Beautiful certificate from the Black River & St. Lawrence Railway Company issued in 1870. This historic document was printed by Benj D. Benson and has an ornate border around it with a vignette of a steam locomotive train. This item has the signatures of the Company's President, Samuel H. Beach and Secretary and is over 137 years old. The Carthage and Adirondack Railroad. -- The building of this road was the consummation of a project conceived by George Gilbert, of Carthage, N. Y., as early as 1865. At that time very little lumbering had been done in the country now tributary of this road. A tannery had then recently been erected at Natural Bridge village, and at Harrisville, Lewis County. (P. 125) The large lumber interest at Gouverneur, St. Lawrence County, that has now for more than 20 years drawn almost entirely from this section for its supply of logs, was then in embryo. Little was then known of the large mineral resources of this locality; yet small quantities of very excellent iron ore had been mined, and the sanguine predicted its existence in endless quantities. By occasional trips through this section Mr. Gilbert had become acquainted with the large resources of the locality in its forests, and the great wealth that might be derived therefrom if some adequate mode of transportation could be provided. The importance of penetrating this country with a railroad, having its starting point at Carthage, began to be discussed by him, and while every one conceded the desirableness of such an enterprise if it could be accomplished, yet the poverty of the country to be directly benefited was so great as to lead most people to view it as a quixotic undertaking. Nevertheless the project found some friends who thought it worth while to try and see how much interest could be developed. Acting upon this idea Mr. Gilbert prepared a bill and submitted the same to the legislature of 1866, providing for the incorporation of a company with power to construct a railroad from Carthage, Jefferson County, N. Y., to some point on the Oswegatchie River, at or near Harrisville, in Diana, Lewis County, and to purchase timber lands in unlimited quantities and engage in the business of lumbering. This bill was amended by the legislature by striking out the provision empowering the company to purchase lands, etc., and then passed it. It became a law, but without the element that in the judgment of its author made it of any particular value. Nevertheless it served the purpose of forming a nucleus which was of some service in working up the scheme. In the fall of 1866 very thorough preliminary surveys were made between Carthage and Harrisville. Statistics were collected, and in the following winter a report showing the feasibility of the route and the resources of the country was made and published. This report was very generally circulated and attracted much attention. Carthage was then a village of nearly 2,000 inhabitants, nearly equal to the number of inhabitants in all the remaining country along the line of this proposed road. The proposition was then to build a railroad about 20 miles in length through a section of country containing no men of large means, and where the business necessary to its maintenance would have to be created to a very great extent. Nevertheless confidence in the scheme began to increase. In the following year the Clifton Company began the construction of a railroad from its mines, in the town of Clifton, St. Lawrence County, to De Kalb Junction, on the Rome, Watertown, and Ogdensburg Railroad, using wood rails instead of iron. This was a new idea, and seemed to be a feasible one for a pioneer road in a country where timber was abundant. In the fall of this year preliminary surveys were made from Harrisville to a point of intersection with the Clifton road in the town of Russell, St. Lawrence County, and soon after the work of securing pledges for a sufficient amount of stock to organize a company (P. 126) under the general law for the incorporation of railroad companies was set about in good earnest, and prosecuted with a zeal that seemed to preclude all doubt of success. In December following the persons pledging subscriptions for stock in the company to be organized met at the hotel in Harrisville and selected a board of directors; but the articles of association then adopted were not signed, and the 10 per cent was not paid in until the latter part of June, 1868. It was provided that the company should be known by the name of the Black River and St. Lawrence Railway Company. The length of the proposed road was to be 38 miles, and was to extend from the Black River at Carthage to the point of intersection above named. The length of the proposed road was to be 38 miles, and was to extend from the Black River at Carthage to the point of intersection above named. The amount of capital stock as fixed in the articles of association was $380,000. The board of directors selected to serve the first year was composed of George Gilbert, Hezekiah Dickerman, Richard Gallagher, Jackson Weaver, Samuel H. Beach, Joseph Palmer, William Palmer, William Hunt, Silas Bacon, George M. Gleason, Henry Rushton, Lucius Carr, and George Smith. Samuel H. Beach was made president; George Gilbert, vice- president and secretary; and Henry Rushton, treasurer. In the winter of 1868 laws were passed authorizing the company to use wood rails instead of iron; also authorizing the several towns along the route of the proposed road to issue bonds, and subscribe for and take stock in this company. In pursuance of the provisions of the last named law the town of Wilna subscribed for stock to the amount of $50,000; the town of Diana, Lewis County, subscribed for a like amount; and both of these towns paid their subscribed for stock in the amount of $35,000, but paid only a small part of its subscription. The work of building this road was let to Row, Fields & Co., of Brockville, Canada, in the winter of 1868-69. The work of construction was actually commenced on April 29, 1869, and prosecuted by the contractors until about the middle of October of the same year, when some difficulty arose between the directors of the company and the contractors, resulting in the directors assuming the work of construction and the discharge of the contractors. Litigation ensued, but was subsequently settled; work was suspended during the winter, but resumed in the spring and prosecuted in a very moderate way until late in the fall, when further operations were stopped for the want of funds. The road was operated, so far as completed, for a part of one year, when it was practically abandoned, and nothing further of any moment was done with it until the organization of the Carthage and Adirondack Railway Company in the spring of 1883. For sometime previous to this Byron D. Benson, of Titusville, Pa., had been investigating the extent and character of the deposits of iron ore at Jayville, Fine, and other points in St. Lawrence County, the title to which had been secured by Joseph Palmer, of Harrisville, to be used in aid of the completion of this road. Mr. Benson and his associates became satisfied (P. 127) that these ores were of sufficient value to warrant the construction of a railroad from Carthage to Jayville, and a company was organized for that purpose, as above stated. 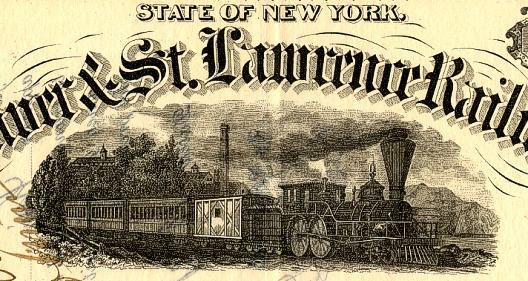 The property and franchises of the Black River and St. Lawrence Railway Company were transferred to the new organization, and the work of construction was commenced and prosecuted for a short time, and then suspended until 1886, when the road was completed to Jayville, a distance of about 29 miles. In the summer of 1887 an extension was commenced from Jayville to Little River, in the township of Chaumont, St. Lawrence County, which was completed in the summer of 1889. Although not as much iron ore has been transported over this road as its promoters expected, yet in other respects the widsom (sic) of its construction has been fully demonstrated, and the shipment of ore will undoubtedly be greatly augmented at no distant day. The present company is an outgrowth of the former one, and it is evident that neither would have been formed and the road not constructed but for the untiring efforts of Mr. Gilbert from the first conception of the enterprise until the fall of 1869, subsequently reinforced by Mr. Palmer's efforts in directing attention to the mineral resources of the country penetrated by it.